Fruumo Download Manager is an extension that lets you manage and control all your downloads within Chrome without the need for any external download manager. Previously, we’ve covered Fruumo’s other handy extensions such as a Tab Manager and Fruumo Notifier, both of which were fairly awesome, and their download manager is equally impressive. Fruumo sports a great looking interface that looks way better than the default Chrome Downloads UI. It’s also fairly easy to setup; simply install it via the link provided at the end of this post, and you’re all set. When installed, the extension adds its icon to the omnibar, so you may easily access your downloads. Once setup, you can click this button to access the extension’s settings. Here are some of the key features of Fruumo Download Manager. Fruumo’s interface carries a sidebar on the left that lets you navigate between the Downloads, Multi-download, and Settings sections. 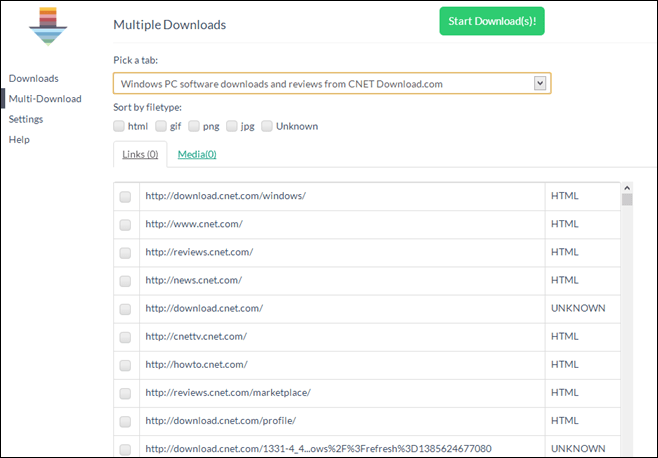 While I’ve already mentioned what Multi-Downloads does, it’s worth explaining that you can also sort the list of available downloads n a page by file type. For instance, if a download page carries loads of PNG and JPG images and you only want to download the JPEG files from the bunch, simply mark JPG to hide everything else.